Levi van Veluw's Landscape video will be exhibited during this exhibition. Ominous to optimistic. Innovative and interactive. 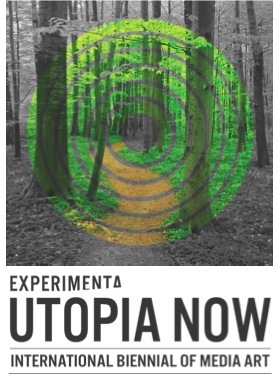 Experimenta Utopia Now International Biennial of Media Art chases the dream of a perfect world.Daring and double daring you to take on the fate of the world, Experimenta Utopia Now 2010 reveals the flaws in our drive to engineer a perfect world. Pull up your leg warmers and bust a move with our interactive dance party in a box; become a sticky shadow magnet and lead a chorus of interactive singing plants; take sides as Australian and international artists unite and fall out over the future survival of the planet.Showcasing more than 25 works from countries including Australia, Japan, Austria, India, Germany, Canada, France, Taiwan and the UK - Experimenta Utopia Now critiques the scope for happiness on earth as we know it, pokes fun at social and physical boundaries and questions the human race's ability to preserve itself.Experimenta Utopia Now promises capital F fun with some capital A art. Irrepressible works include the funkadelic International Dance Party, a complete party in a box which transforms from humble transport crate into a powerful party machine that increases its frantic output the harder and faster you dance; Akousmaflore, a hanging garden composed of living musical plants that react to human gesture and gentle contact; Shadow 3, an interactive installation where the by-products of our consumerist society fall from the sky like rain, inundating your shadow with a deluge of debris; and You Were in my Dream, an off-the-wall 'choose your own adventure' dreamscape where interacting with familiar fairytale characters draws you into an enchanted fractured forest. Adding to the spectacle, renowned Japanese/American artist, Momoyo Torimitsu performs with her life-size robotic businessman 'Miyata Jiro' as he crawls his way commando-style through the CBD battlefield like so many before him.